DESCRIPTION: Vista De Sangres is a residential development located near the Santa Fe Airport that has 25 single family homes and includes walking trails and a park. 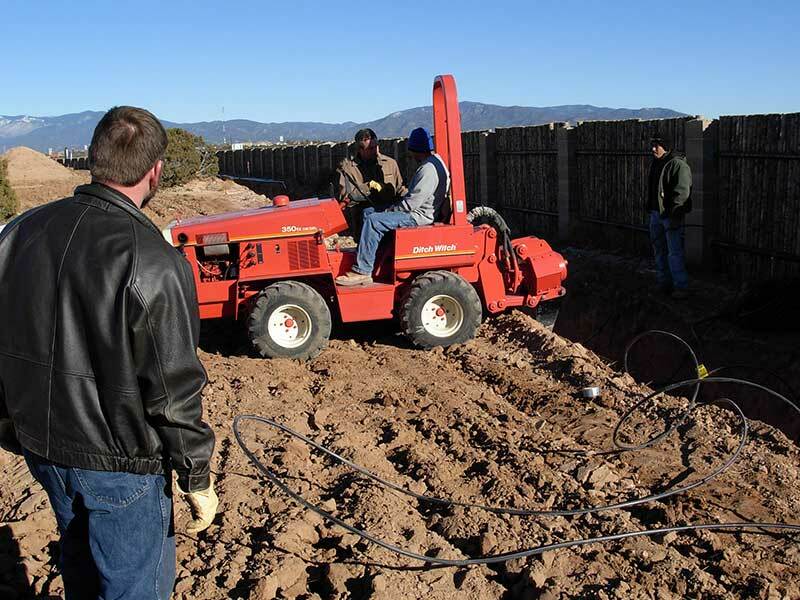 Treated effluent from the wastewater system is being re-used for irrigation in the development’s open space areas. WS and Worrell Water Technologies (WWT) of Charlottesville, VA were the Design-Build team for the project, with WWT providing the treatment system design and IWS providing the dispersal system design and construction of the overall system. IWS often teams with local engineering firms to provide clients best value and additional resources to complete the project.The design flow of the system is 10,000 gallons per day, and is treated with the following treatment process: a) 1, 25,000 gallon primary septic/anoxic tank (20,000/5,000); b) 1, 12,000 gallon recirculation tank (7,000 recric/5,000 discharge); c) 1, 8,000 gallon dosing tank; d) 4, Orenco Advantex pods; and e) 4.8 acres of Geoflow subsurface drip irrigation. Dave Maciolek, Senior Environmental Engineer for WWT, commented on the sustainability issues related to the project “We utilized the treated wastewater to create some irrigated grasslands which enhanced the native vegetation at the site”.